Sports Costs > How Much do Archery Lessons Cost? How Much do Archery Lessons Cost? Archery lessons may be needed in order for a person to learn the true art of shooting a bow and arrow. As with any sport, it is almost impossible to attain a high level of archery in a day. Many people may think the sport looks easy, but in essence, it actually involves a lot of skill and patience. While some can learn on their own, many choose a professional to teach them the mechanics so they can shoot a bow properly. On average, an archery class is going to cost anywhere from $10 to $27 or about $50 to $80 per hour for private lessons. Some ranges will bundle the classes while others offer classes individually. Great Southwest Gun, an archery range based in Texas, charges $22.50 for their intro class and $15 for each additional course. For those who want to take intermediate courses will pay $22.50 for the first course and $15 for each additional lesson. For those who want to have personal lessons with the instructor, the costs can be anywhere from $25 to $50 per hour. This price will depend on the experience of the teacher and the student. Standford Archery, another archery center we found online, offers one-on-one lessons for $50 per hour or $75 per hour if two people are involved. Those who want to train with Stanford’s head coach, the costs go up to $75 per hour for one and $100 for two. 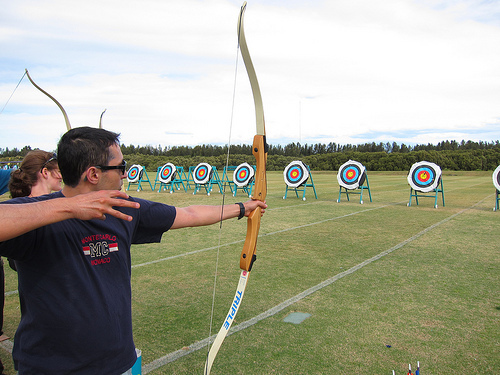 An archery camp which lasts one week can cost anywhere from $100 to $325. While some camps are designed for children, there are camps for adults as well. These classes will be held five to seven days of the week and each lesson will last one hour. The AZ Archery Club, for instance, offers a four day per week youth camp for $300. Lessons are typically 30, 45, or 60 minutes. The longer the lesson, the more it will cost. The skill level of the teacher and the student can both make a difference. If the teacher is only experienced in teaching children, the lessons will be cheaper. However, if the teacher is experienced in teaching archery and the student is at a high level, the lessons will be more expensive. Lessons may be offered to individuals, to small groups, or to large groups. The more people that are in the group, the less it will cost per person. For a rookie archer, most will start with an introductory course, a course which is going to help you find the right bow and explain what the draw length and poundage means. This intro class will also help with adjusting your bow, picking out the correct arrows, and explain the function in full detail as well as reviewing range rules, what safety gear you will need and how to get the best use of the bow. Once a student graduates from an introductory class, the next set of classes will include paper tuning, target shooting, concepts of shooting, troubleshooting a bow, and preparing for tournaments. All instructors should be NAA certified. Typical classes are going to hold 10 to 12 students. Most classes are for children 8 years and older and typically last up to one hour. Most will not learn from the first lesson and many ranges will offer unlimited classes. Generally, the first course will cost the most; each class that follows can cost 30% less on average. While some ranges will include the bow for the rookie class, they may require that you purchase a bow set after the first lesson. Most bows will cost anywhere from $50 to $200. The costs will depend on the size, poundage and brand. Rentals are often available for $10 to $20. If you are going to purchase a bow, additional safety accessories, such as a stabilizer bar, sight, sling and arm guard, are all recommended. If you plan on purchasing a bow, check with some archery shops to see if they offer discounted lessons. Many are more than happy to train for an hour if you purchase equipment from them. If you are going to take lessons, you should put in the time to practice between lessons. Without this practice, the lessons may not do much good. If you are going to a higher level of archery, you may want to consider private lessons. Group introductory lessons offer the basics that everyone should know. Once you have mastered the fundamentals, it would be more helpful to address your personal form and technique and correct them. Consider buying your lessons in bulk. The more classes that you purchase ahead of time, the more you can save. If you do not mind, take your classes with a group of people. That way, you can get the cheapest rates possible. Generally, if you take the lessons one on one, this can incur the highest fees. Some archery centers offer an introductory class for free to help you get a feel for the sport.